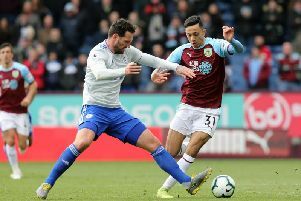 Clarets boss Sean Dyche believes goal line technology has to be implemented in the Championship, after Burnley claimed a crucial point with a remarkable injury time leveller from Michael Keane at Brighton. Keane had already forced a header in to make it 2-2 from substitute Matt Taylor's corner, but despite the ball clearly being over the line, the officials didn't give the goal. Moments later, he left no doubt as he thumped in another Taylor flag kick, to stay top of the table, three points clear of Middlesbrough, and four ahead of the Seagulls. Earlier, goals from Dale Stephens and Anthony Knockaert sandwiched Andre Gray's 23rd goal of the season, and Dyche said: "The disappointing thing is, if it's close, we understand it's difficult, but we saw one at QPR when one was given out of play that wasn't, so they will be a bit disgruntled with that, but we are at the top end of the market at the moment and there is a lot at stake, so you're expecting those decisions to be viewed properly, and it's a goal. It's a clear goal and we all know that. "Usually, not always, plays can get up to all sorts, but when every player reacts as instantly as that, usually that's a clear sign it is what it is, a penalty, a goal, whatever. "If you look at the VT, everyone reacts immediately. "I was amazed the linesman didn't blink, I was amazed the referee didn't go over and at least ask the linesman to recall his thoughts, as we know sometimes that can give a different point of view, but c'est la vie." He added: "I think that with what's at stake now in the Championship, I can only imagine that it will drip feed in, the goal line technology, I'm not saying it will, but that's my gut feeling. "It should, and that's not being disrespectful to League 1 and 2, because I played in those leagues, but there is so much at stake now, financially and the kudos of being in the Premier League, so I think it has to. "That is a great example, it's got to be given a goal when it's that far in. "There's no guarantee if that goes in you get the next one, so let's not overthink it, we'll be crying in our sleep, but the facts are, when it's that obvious, it had to be given. "That's not a close one, it has to be officiated properly." Was it a case of justice being done? : "You can never know what happens after the goal that's not given, it was in, but you'd think that would add to the nervousness in their performance for the rest of the game. It doesn't guarantee you'll win it, but they were playing counter attack football for the last half an hour or so, and we were giving a fair account of ourselves to try and get back in the game. "If that is given, the feel of the game is still with us. "I don't know if it's justice, it almost implies you needed a bit of luck, but it was a fantastic cross for the last set piece, with Keano heading it cleanly into the goal. "I think there's no luck in that, it's by design and we were really pleased with that. "A team who something like 26% of their goals against are from set pieces, and we felt we were strong in that area and could be. "We should have had three goals of course, which would have proved that point."